The multimeter is an instrument that performs a measurement on a signal and then determines one or more specific properties of that signal and displays these as numeric values. Displaying can be done using a numerical display or with a gauge. 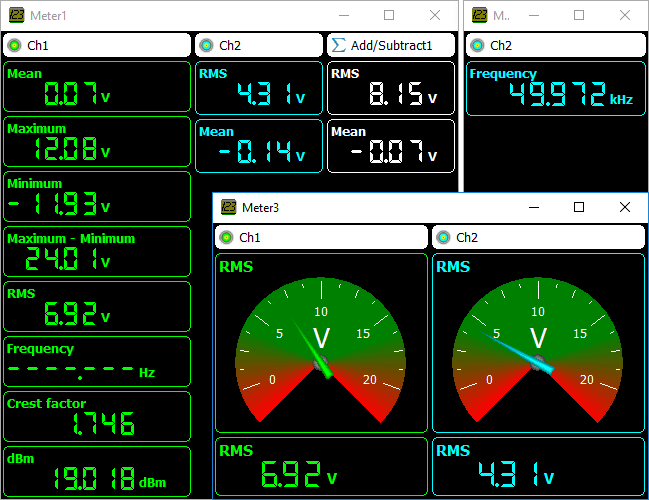 The multimeter can be used to measure or monitor specific properties of a signal, like RMS value, frequency, maximum value etc. When using a gauge display, it can be very helpful when adjusting a circuit for a specific property, e.g. adjusting an offset to zero. Display any number of sources. These can be signals directly from hardware instruments but also mathematical signals created by I/Os.